Combo offers, package deals, super value offer – all this and even more. Companies often use package deals to make people spend more by adding more products as a part of the package unmindful of the people’s needs. Take the starter pack in Tata Sky or the welcome pack in Dish TV; you will end up paying for channels you’ll never see too. At times, package deals are wisely used to circumvent certain rules and regulations too. Recently, Tamil Nadu Govt. has regulated the ticket price for movies, so that theatre owners don’t exploit the people based on the demand situation. However, knowing the demand for Rajni films during the opening days, selling the tickets for Sivaji movie at that fixed price will be a very tough decision for the theatre owners, indeed. 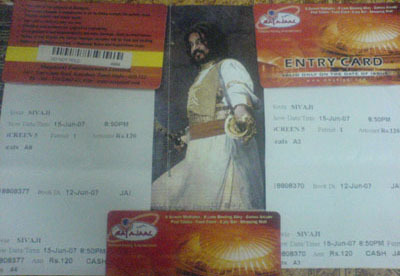 To abide by the rule of law and yet to make more money, the Mayajaal multiplex in Chennai decides to go the package deal route. A ticket costs Rs 250 for a show there, 120 is for the movie ticket as per Govt. regulations and another Rs 130 for an Entry card which is valid for one day and can be used in the bowling alleys, pool tables or other gaming arcades inside the multiplex premises. Since on that day every one will have this entry card, all the gaming facilities will be overcrowded and end up being useful to limited people only. Well, I too got the tickets thru that package deal for the first day show. But I don’t want to complain. When theatres which are less standard than this one, sells tickets at a much higher price thru black market routes, I don’t mind paying Rs 250 to get the ticket on the first day for the film Sivaji in Mayajaal. Hope and wish ‘The Boss’ rocks. The entry card was accepted in food court and in snacks counter too. So it didn’t go waste. One thing I failed to mention in the post is the additional Rs 50 they charge as entry fee in addition to the Rs 250 for the ticket, that’s the part of the profit package here. Business aside, the movie was great. It was more than the money’s worth. And the party time starts for “The Boss” fans now. really the movie was good?